"A special force in a special kind of hell!" 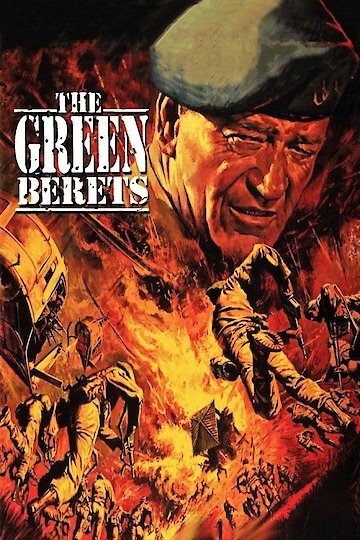 The Green Berets is a Vietnam War film that came out in the year 1968. The movie had the legendary John Wayne in it. In the beginning a newspaper reporter named George Beckworth comes to Fort Bragg to do a briefing on the American military in Vietnam. He talks about explanations about the involvement in the war. During this time the Special Forces soldiers show people the various Soviet and Chinese weapons that they have captured from the NVA. At Fort Bragg, many civilians and journalists are quite skeptical about the war but are told by the soldiers that they are in Vietnam to eliminate international Communism. Beckworth is still skeptical about the war and plans to go to Vietnam to show people that involvement in this conflict is unnecessary and pointless as well. A colonel named Kirby is assigned to go to Vietnam to help participate in the war. He promotes a man named Petersen to help his team in the conflict in Vietnam. Kirby, Petersen and the team arrive in Vietnam and are accompanied by Beckworth. During this time Beckworth witnesses the soldiers providing humanitarian aid to the Vietnamese. Shortly after this a North Vietnamese attack takes place and Beckworth changes his mind about the war. Due to his change opinion he believes that the war is justified and fears getting fired by supporting the war. After the attack Petersen meets and becomes friends with a boy named Hamchuck who is an orphan. His family was killed and he has nobody to turn to as a result. Later in the film Kirby and his team go on a raid to capture a Colonel named Cai and succeed. However many of the soldiers including Petersen die. In the end Hamchuck looks for Petersen but meets with Kirby and gives him Petersen's Green Beret. Kirby and Hamchuck then walk on the beach together in a touching final moment. The Green Berets is currently available to watch and stream, buy on demand at Amazon, Vudu, Google Play, FandangoNow, iTunes, YouTube VOD online.